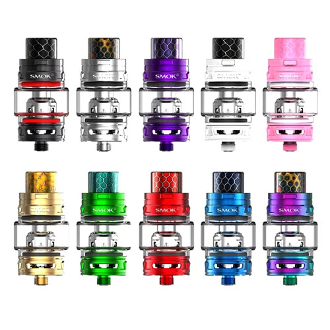 The TFV12 Baby Prince 4.5ml Sub Ohm Tank by SMOK is their latest in a line of top-notch vaping supplies. It is made of stainless steel and glass using the crown style design. This Tank has a unique feature when it comes to the size of the tank. If you use the bubble glass tube you will enjoy a 4.5ml e-liquid capacity. If you are looking for the same power but a smaller capacity, using the standard sized glass tube will give you a 3ml capacity. It has a top-filling rotary design with a locking mechanism. This will help to eliminate leaking. Its wide bore drip tip made of cobra resin is comfortable as well as aesthetically pleasing. It utilizes the new TFV8 Baby Beast Atomizer Heads which provide you with greater vapor production and improved flavor. It also has a large airflow chamber in the center and dual adjustable wide airflow slots as well.